Young Jim Hawkins lives a quiet life as the son of an innkeeper. This all changes when an ancient sailor takes up lodging at the inn. Jim is both horrified and fascinated by the captain's bloody stories. But when the old man dies without paying his bill, Jim must search the sailor's one possession, a large sea chest, for payment. In doing so, he unknowingly pockets an old map from the chest. But Jim is not the only one interested in the sea chest, and he has to flee when a group of cutthroats shows up to ransack the few possessions of the old sailor. The family doctor recognizes the map as the key to a fortune, which commences a Caribbean treasure hunt. With the pirates only steps behind, Jim races to reach Treasure Island. Seventeen set sail, but how many will return? 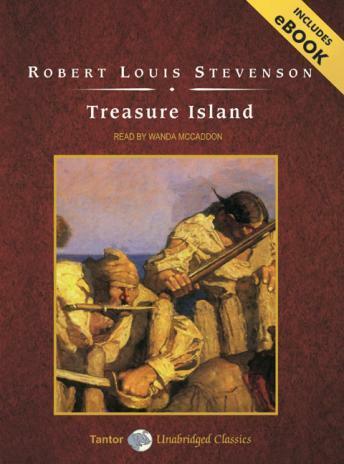 Complete with peg-legs, parrots, pieces-of-eight, and the original Long John Silver, this novel launched Stevenson on his long and fascinating writing career and marked the beginning of the pirate genre.